3c dull red type II (#11A) tied by "New-York Dec 15" (1853) circular datestamp on folded letter to Boston. 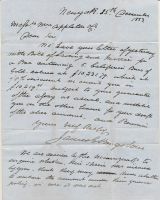 William Appleton & Co. correspondence. "New York 15th December 1853. Messrs. Wm. Appleton & Co.
We are desired by the Nicaragua Co. to inquire whether their specie was insured by you, that they may know whether to declare the assessment under their general policy in case it was not."